Published: March 15, 2013 at 01:40 p.m. Updated: March 15, 2013 at 04:27 p.m. Researchers have estimated a Raiders fan complains about the Tuck Rule every 19 seconds each day. The estimation drops to about four seconds when said Raiders fan is at a sports bar on a Sunday afternoon dreaming about the glory days. But good news for those Raiders fans. 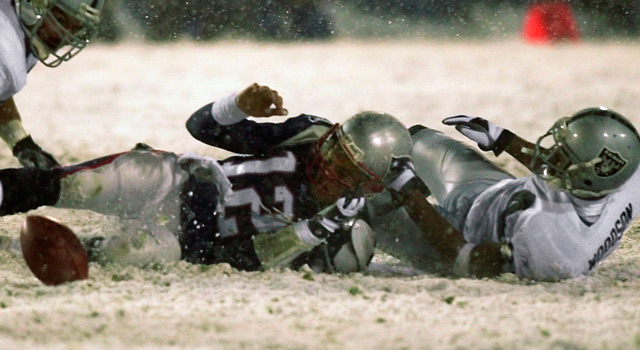 It appears the "Tuck Rule" could be a thing of the past. We don't expect you to show some couth (Google it) about this. At least the Raiders organization is keeping it classy about this news. All right, that is kind of funny. Well played, Raiders. Though, we can hardly fault the fans here in L.A. constantly complaining about the Tuck Rule when this is the example you set. Just saying. In any event, the Tuck Rule looks like it's out. The news is bittersweet because it brought so much joy to us non-Raiders fans out here. With that in mind, I offer up six rule changes which must be implemented, eliminated or simply transformed. I've never been down with the Bert Emmanuel rule. The rule defies logic and physics. If any part of the ball hits the ground, it's not a catch. That's a trap. If you want to change one thing about catching the football, scrap the "in the process" rule, which is way more egregious. How do we change a rule for Emmanuel and not Calvin Johnson? Personally, I'd rather see players casually flip the ball back to the referee after they score a touchdown. Act as if you've been there, as they say. But you certainly shouldn't legislate against players having a little fun after they score. This is entertainment right? I look at end zone celebrations the same way I look at those "Housewives" reality TV shows. I certainly don't care for them, but I wouldn't want to deny others who enjoy it. If you also enjoy your football on Saturday, you know college does way better with certain rules. Replay is better; the pass interference is better and so is overtime. I say you bring in all three of those rules to the NFL. The NFL has benefited from the two-point conversion. This should be no different. Get rid of the red flag (you're welcome Jim Schwartz), only 15-yards for PI, and each team starts overtime on the 40 (small tweak). Done and done. This never made sense. Trying to block a field goal or PAT is illegal? Not only should illegal leverage (or leap frogging) be allowed, but it should be encouraged. This would open the door for smaller player to be the designated cannonball to be tossed in the air (like rugby). Heck, you could probably take a female flyer from the cheer squad for this exact purpose. We kicked this one around on the DDFP recently, and it's genius. When your team scores a touchdown, a player currently on the field has to kick the PAT. Coaches would hate this because it would add another layer of strategy to their jobs, but think how much fun it would be to see a defensive player have to make a kick after a Pick 6. This one is for the schedule makers, but please, no divisional games in the first month of the season. Too much is at stake for a divisional game to be thrown away in Week 1. Trust me, people will watch Week 1 regardless. What you do is wait until Week 4, dub it rivalry week, and you suddenly have a new tent-pole portion of the season. You're welcome. "Six greatest Cinderella stories in NFL histor..."